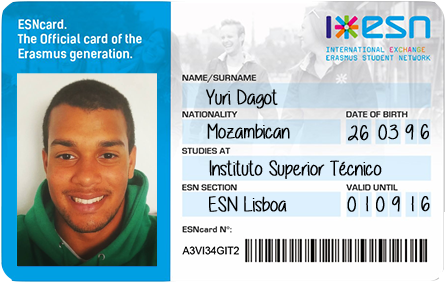 The ESNcard is also accepted as valid student ID in many other business in Lisbon, because ESN is an organization recognized by the European Union. The card is valid for one year, so you can freely use it after you go back home or while you are travelling across Europe. All of this for only 10€! Where can I get the ESNcard? ·You can get the ESNcard clicking here. ·You can make it in our Office, at Travessa dos Inglesinhos, Nº 52 (Bairro Alto). Check this link to see how to get there. ·You can make it at your university’s Welcome Days (look for our stand or ask in the International Office). After getting your card, register it in ESNcard.org with just a few steps and get access to an international level of partnerships and discounts. What do I need to bring to get the ESNcard? Photo (passport size) - If you don't have it, you can glue it later.